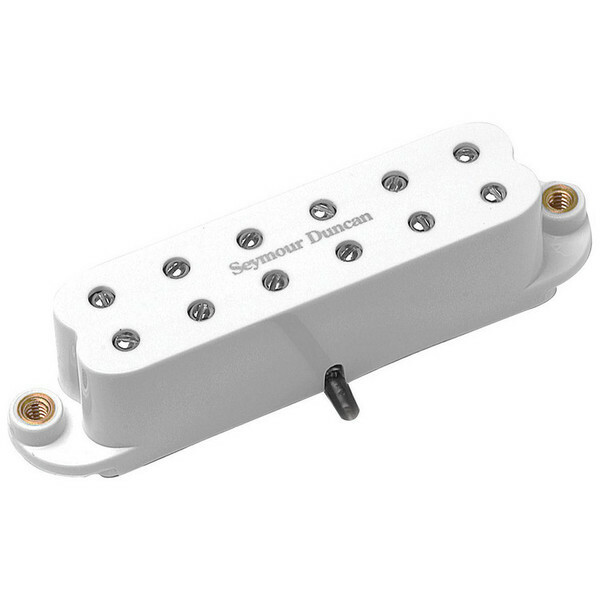 The Seymour Duncan SL59-1 Little ?59 Strat Neck Pickup, White, is a P.A.F.-voiced single-coil-sized humbucker. It works great for country, jazz, funk, blues, classic rock and heavy rock. Players of pickups in the SL59-1 family include Bill Frisell, Audley Freed (Cry of Love & White Crowes), Courtney Love, Jake Kelly (Gary Allan), Jon Hudson (Faith No More), Brad Fordham (Jimmie Dale Gilmore & Kelly Willis), Ron Laster (James Brown) and Glen Campbell. Designed to Bring Warm, Smooth, P.A.F tone! The SL59 was designed to deliver that warm, smooth Patent Applied For humbucker tone whilst being a single-coil size. This neck pickup has an even, dynamic response, and you can fine-tune the string balance and dial in the right amount of punch thanks to the SL59's adjustable pole pieces. This pickup has less output and more upper-mids than the JB Jr. Included is a four-conductor hookup cable. You can also get the bridge version of the SL59-1 Little '59 on Gear4music.com. This pickup works for all well-balanced instruments and works equally well with maple and rosewood fingerboards.